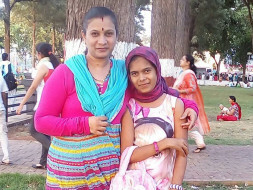 Neha is just 15 years old and she is suffering from a kidney disease. She has been under treatment for more than a decade now. And her only ray of hope is an urgent kidney transplant. After her 3rd birthday, Neha started to fall ill quite frequently. Her mother, Anita, noticed that there was something wrong with the fever and the vomiting tendency had gone up. She immediately took Neha to a child specialist in Karad where she underwent series of tests. But the reports shattered the family completely- “4-year-old Neha was suffering from kidney problem”. “When Dr. Bramhnakar said that my child will be fine after a couple of years, I could not ask for anything else. I knew that Neha was in pain although he made faces of a happy child. We had to continue the medicines since she had trouble in passing urine. With time, she was becoming steroid dependent, but we could not help. The doctor tried to lower the dosage, however, the result was her admission to the hospital. I cannot even remember how times I had to admit her for blood transfusion”, says the mother. Till 2012, Neha was on steroids. However, things remained almost same. She was becoming steroid resistance and her conditions started to drastically deteriorate. The worried parents traveled to Pune to visit a nephrologist and the new medicines worked wonder for her. She started becoming active and enjoyed going to school as well. “I would say even if she was fragile and got infections, she recovered quickly as well. She showed some real signs of improvement”. They were happy unless Neha showed signs of fever again in 2014. She became really weak due to very high blood pressure and was immediately admitted to the hospital. “I could not hold back my emotions when the doctors said that both her kidneys have failed”, said the father, Shankar. "For the last couple of years, what I have been going through is something I cannot express in words. My Neha is suffering kidney failure while Nikita is suffering from serious heart ailments. This is not the end of story. My husband met with an accident 2 years back and currently stays at home. Every time I see him, I cant keep strong anymore. I don't want Geetanjali, my youngest daughter, to feel neglected ever. I know I have to keep going. Each round of dialysis is taking a heavy toll both emotionally and financially on us. Every time I go to the hospital, I am scared to meet the doctor. I don't want them to find new symptoms anymore. I don't know how to arrange money for them, but whatever happens, I will not give up", says Anita. The family has been undergoing an emotional roller coaster since long. Shankar used to work in a Dhaba and earned around 25000 monthly, while Anita gives private tuition at home. But when the family is only run by Anita’s earnings, it is extremely difficult. Anita and Shankar reached out to their relatives for help. But no one was ready to help them. Till now, they have spent more than 10 lakhs for Neha. They spent their savings and are now left with nothing. Neha has started responding positively now. The doctors have planned for the kidney transplant in the month of December, however, the family has to deposit the money before. Your contribution can save this young girl and help her live. Neha is undergoing dialysis every alternate day. There is not much improvement in her health as of now. Her blood pressure drops all of a sudden and she is receiving three kinds of medicines for the same. We haven't found a donor yet and the doctors suggest that I should not be the donor since I am the primary care giver for both my daughters and I will not be able to take care of them if I am admitted as a donor. It is my humble request to all of you to please keep sharing the campaign. Each donation means a lot for my daughter's treatment. Do keep her in your prayers. Once again, thank you all for your support. 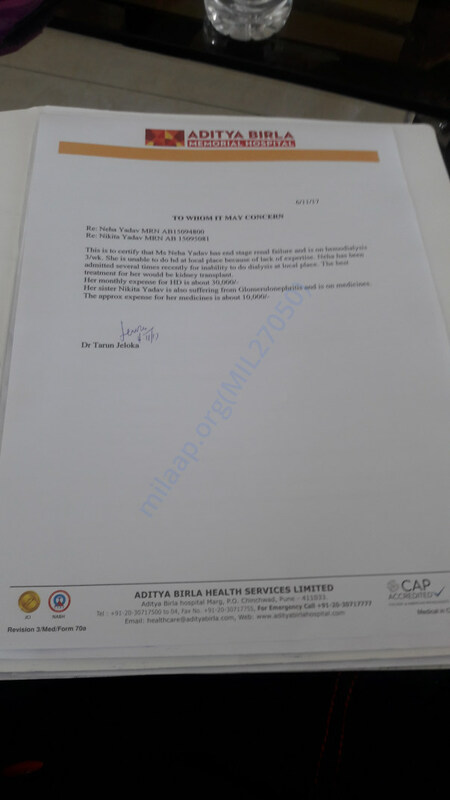 Here is an update on Neha's health. Currently, she is at home and doing fine. She has to undergo dialysis thrice a week. She is also on medication so that her blood pressure is controlled. We are still looking for a prospective donor, and more funds so that the transplant can be done as soon as possible. Please share this campaign. Thank you for your support.